You are here: Home / Art on the Road / Spring is in the Air, Sort of…. Spring is in the Air, Sort of…. 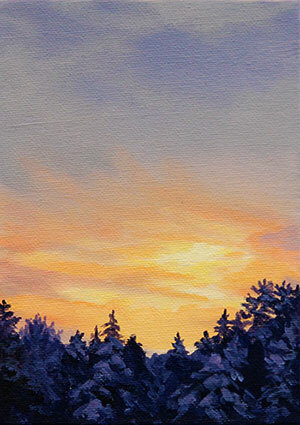 I thought I would add this week’s small painting just in case you have not been out to the Small Paintings Blog. All of the small paintings on the blog are available for under $95 US (this one is $50). After my last post, I decided to take one more trip out on the ice. The cold snap was coming to an end and it is very likely that the ice will be unsafe in places after this next thaw subsides. We are getting close to Spring and it was 11C today (51F). I knew this would be my last trip out for the season. As it was, the pressure crack I showed you on the last post expanded substantially due to the freezing temperatures we had sustained for 5 days. We had overnight lows around -27C (-16F) so the expansion was even greater than we expected. 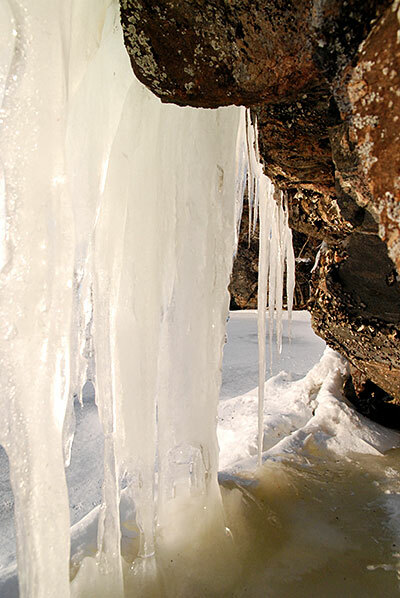 This makes the ice crack and groan – and worse, water seeps to the surface and it is difficult to know how thick the ice is. Conditions made us decide to abandon the open lake for smaller bays and the ice fall photograph, above, was the result. There are more images on my Flickr page. Gorgeous painting, as always, Michelle. I’m glad you still post them here. I’m not much of a roamer in the blogosphere. The ice looks fantastic; thanks for catching the pic before it all melts away. A lovely little painting! Be careful about that ice these days, certainly. It was 25C here today; flowers in bloom, baby birds starting to appear. Your small works are so lovely, Michelle! I’m enjoying that blog too. These photos are so very amazing. What an amazing beauty the ice creates. I truly have no mental frame of reference for those temperatures! You painted the sky very nicely Michelle. Beautiful warm colors! No wonder the ice is melting! Lana – the ice is rotting now, but there is still 18 inches in most places. Thanks, Sadia! I actually took the photo for that early in the season…. Beautiful photo Michelle, very good idea.